The world is faced with intrinsic environmental issues. Among these issues, the minimization of greenhouse gas emission to acceptable levels presents a high priority. This study seeks to help to reduce the greenhouse effect in sustainable manner. A resorcinol–formaldehyde xerogel was synthesized at specific conditions and used to prepare an activated carbon xerogel (RF-ACX). RF-ACX exhibited micropores in range of 1.2–1.4 nm, a surface area of 496 m2/g and a cumulative pore volume of 0.81 cm3/g. Scanning electron microscopy showed that it is made of microspherical particles with an almost uniform particle size of 1.3 ± 0.2 μm. Equilibrium and kinetic studies for the adsorption of CO2, CH4 and N2 on RF-ACX were conducted at five temperatures (293, 303, 313, 323, and 333 K) and pressures of up to 1 MPa. The adsorption capacity on RF-ACX was highest for CO2, followed by CH4 and then N2. 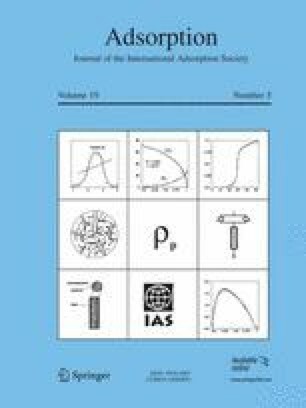 Isosteric heats of adsorption and adsorption rates were investigated. The measured adsorption equilibria were fitted with the extended multisite Langmuir adsorption model and further used to predict adsorption equilibria of their corresponding binary systems. The online version of this article (doi: 10.1007/s10450-013-9508-5) contains supplementary material, which is available to authorized users. Ahmed Awadalla-F is on leave from the National Center for Radiation Research and Technology, P.O. Box 29, Nasr City, Cairo, Egypt. This publication was made possible by the support of an NPRP grant from the QNRF. The statements made herein are solely the responsibility of the authors.